The version I played was a prototype copy, but the artwork, components and gameplay were almost completely as they will be in the final version. Snowdonia is to be published by Lookout Games at Essen 2012, and so hopefully will receive wide attention on release. Note There are as yet very few photos available to illustrate this review. I took one poorly lit and out of focus shot with my phone, which will have to do for this review. Apologies for the low image quality. I have used the image repeatedly through this review as I refer to it repeatedly, to remove the need for scrolling back to the image for reference. There is a central board with various spaces. Along the top are the action spaces, which are pre-printed for 3 or fewer people. There are playing card sized overlays for 4 or 5 player games. Beneath this are places to hold available resource cubes – iron, stone and coal. There are tracks to show how efficiently rubble may be cleared and track may be built. There are spaces for wooden disks which indicate what the weather is like, and what it will be in the next two turns. Across the middle is an event track, of which more later. In one corner is a pack of goal/action cards, and spaces to make three of them available for players to select. There is a pack of cards representing the rail route to be built, which is double sided. One side represents the Snowdonia mountain railway, and the other represents another railway in Wales – Ffestiniog, I believe. There are seven train cards (five of which are shown across the bottom of the board in the picture). In addition there are the customary wooden bits to represent the resources in the game. Raw material cubes (iron, stone and coal), white event cubes, wooden bars representing manufactured goods (rails), wooden disks representing the weather, and wooden pawns and cubes in each player colour. There are also very small wooden white cubes which represent the rubble to be cleared. I have of course never seen the final game, but what I saw and the knowledge that Lookout games will be the publisher gives me high confidence that the component quality will be of the same high standard which we are used to in modern game design. Personally I found the artwork and presentation rather bland. The cover art we were shown is very much in keeping with the style of other games published by Lookout Games, such as Agricola and Walnut Grove. However the colour palette of the box and the board is very washed out and muted. The board is placed on the table, and action overlay cards are placed over the action spaces if 4 or more are playing. The iron, stone, coal resource cubes and the white event cubes are placed to one side (in our case a cloth bag, although I don’t know if this will be supplied with the game). Twelve cubes are placed on the available spaces on the game board, as printed. The railway to be built is placed around the edge of the board, as shown in the picture. The starting station is actually on the board, and a pawn for each player is placed on this card. The stations along the route are placed around the edge, and each station indicates on it the number of rail cards which should be placed in front of it. These rail cards have a variable points value when completed, which provides some limited replayability value. The rail cards and stations then have rubble (small white cubes) placed on them – the station and track cannot be built until the rubble is cleared. The train cards are placed by the side of the board – I think the number of available trains varies on the number of players, although I’m not certain of this. Some of the trains provide the benefit of some coal cubes, and if so, black cubes are placed on the card. The goal/action cards are shuffled and placed face down on the available spot on the game board. The back of the card has a yellow circle which shows what the weather is – yellow, blue and grey for sunny, rainy and foggy respectively. A wooden disk is placed on the weather spot to show the weather for the first turn. In addition the weather forecast for the next two turns is also indicated in the same way, but I don’t know how this was done during setup. It would almost certainly be triggered by the back of the goal/action cards. Three of the goal/action cards are turned over into the available slots of the gameboard, to be made available for players to choose. 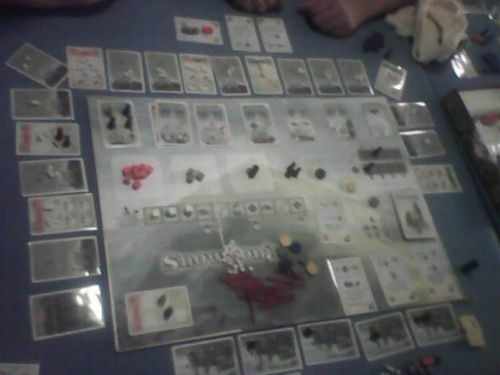 Other resources and placed on or by the board, and start player is randomly determined, and then you’re ready to play. There is nothing particularly onerous to any of this. I never saw it done, but I would estimate 5 minutes as typical. Players typically have two pawns to place on action spaces on the board each turn, although it is possible to have a third if the player has a train and chooses to use a coal cube to generate the extra action. This is the only effect of coal in the game, but it is important. There are a number of different actions to choose from. I am going from memory and can’t guarantee that I am giving them their correct names. Placements are resolved in order, “Gain resources” first and “Surveyor” last. For the first turn the resource space is seeded with 12 resource cubes in a scripted way. At the start of each subsequent turn 12 cubes are drawn randomly from the bag. Iron, Stone and Coal are placed on the available spaces on the game board. The only other cube type which can be drawn from the bag are white Event cubes. These are placed on the Event track and trigger the next event in sequence – more on this in the relevant section below. When placing pawns, players may choose any of the available positions – four in a 4 player game. Usually a player will want the first position since this will guarantee the first choice of available cubes, but placing in the last spot in this section will enable that player to become the first player in the next round. Players take three resource cubes, with the restriction that only one coal cube may be taken per worker. Clear rubble (excavate) – once all rubble is cleared, becomes another Build Track. This is one of the two actions which cannot be used if the weather is foggy (Build track is the other). A worker placed here removes a number of small rubble cubes from the railroad equal to the number shown by the current position on the game board. I’m afraid I don’t know the official term, but it’s the two rows of four dark spaces towards the top left of the image, marked with black pawns. Each time the weather is sunny the pawns move to the right and the Excavate and Build Track actions become more efficient. Each time it rains the pawns move to the left and these actions become less efficient. Only once the rubble has been cleared from a card can the track (on a track card) or the sections of station (on a station card) be built. In the picture you can just make out that the rubble has been cleared from the first two track cards and from the first station card. The fact that this action is unavailable at times, and its efficiency will vary depending on the weather presents some interesting decisions in terms of timing your actions for when they will be at their most efficient, which is a level of play which I enjoyed. A worker placed here allows a player to convert three iron cubes into track (the long wooden stick pieces which can be seen in a heap towards the bottom of the gameboard), or to convert two small rubble cubes into a grey Stone cube. Each worker allows up to three such conversions. This is the second action which may not be selected if the weather is foggy. Also, as with the rubble action, this action is more efficient after an extended period of sunny weather, and less efficient after a period of rain. Provided that all rubble from a track card has been removed, and a player has manufactured a section of track, the lowest track card is turned over on payment of the track, awarding the player concerned (from memory) anywhere between 3 to 5 points. Players should place a cube in their colour on a track card they have flipped in this way for end game scoring, and also because there are goal cards which award points based on the number of track cards a player has built. A player may hand in (depending on the specific train selected) one or (more usually) two manufactured track pieces in exchange for one of the train cards. These trains grant a special ability (lay more track, excavate more efficiently, etc. ), and most allow coal cubes to be paid to generate an extra action – that is, to place 3 worker pawns during placement instead of two. Buying a train and getting extra actions is a powerful move, but in the game I played the designer played the whole game without one to show how they are not necessary to be competitive. There isn’t much point having a mechanic in the game which is so powerful that everyone must choose it – you may as well not have bothered putting it in the game in the first place, so it was good to see that this is a genuine strategic choice. The other action is to build a section of station. Only stations which have been cleared of rubble may be built, and there is a mechanic in the game of which the details escape me, which closes some of the lower stations to players. Sections of station require resources – stone or track sections usually, I think – and earn points for the player concerned. Again, there are bonuses available for these so coloured cubes are used to show which player scored each section for end game scoring. One of the more powerful spots on the board. At the start of each turn there are three goal/action cards available for selection. Each card has two aspects. The first is the Goal. This is a quantity of victory points a player holding the card is awarded if a condition is met. For example 8 rubble cubes could be worth 11 points, or laying three section of track could be worth 24 points. These point awards are a significant part of a players total, and no player could win without them. The second aspect of each card is the Action. This is a one shot special ability which a player can use to give themselves more efficient or extra actions. I can remember actions which doubled the number of rubble cubes which could be cleared with an excavate action, or one which allowed a player to avoid the restriction of only taking one black coal cube when gaining resources. These are powerful abilities, but are only one shot – once used the card is turned sideways to indicate it may not be used again. A nice feature is that the goal and action are never complimentary. So a goal awarding points for clearing rubble will never have an action which helps in clearing rubble. Players will need to look for synergies between different cards – they aren’t offered up without effort. This mechanic is one of my favourite aspects, and is the one single features which raises this game above the herd of worker placement games for me. These cards also determine the weather. On the back of the cards is a coloured circle – blue, yellow or grey for rain, sun and fog respectively. A wooden disk is then placed on the weather track on the board so we can see and plan for what the weather is going to be in a couple of turns time. In the image (although it’s difficult to make out, the current weather is rainy, tomorrow’s weather will be sunny, and the colour on the back of the draw pile is grey,meaning the weather the day after that will be foggy. This is pretty much a pass action when there isn’t anything else to do, although it does generate points and there are goal cards which make it important to do. This is the only spot which has no limit on the number of pawns which can be placed on it. Each time a player uses it, their pawn moves further up the track to the next station – the further up the track you get the more points are earned. When a white cube is placed the game performs a certain event, but it is always done more efficiently than the players. So for example if the icon indicates clearing rubble, and the position on the weather effected track shows the 3 rubble are cleared per action, a player will remove three cubes. However the game will completely empty three whole cards of rubble, regardless of how many rubble cubes were on them. In addition, the game can clear rubble and build track even in foggy weather. I can’t remember all the actions on the action track. I know there were spaces for clearing rubble and building track. There was one space halfway through which forced players to pay an extra track resource or lose their train (so buying a train early would become more expensive). Once the end of the action track is reached the last three spaces are simply repeated until the end of game condition is met. This prevents the game outstaying its welcome. If the game is getting bogged down due to lots of foggy weather the game will still progress and come to an end in (according to the box) about 75 minutes. It also means that players must be able to play flexibly. At the start of any turn there is no knowing whether any event cubes will be drawn from the bag. If they are, the planned move may have to be ditched for an alternative. The game ends when the last piece of track is laid, after which the rest of the turn is completed. Points are then scored for track laid, components of station built, goal cards achieved and position of a player’s surveyor up the mountain. In addition, one of the trains gives a benefit of 9 points. The player with the most points wins. These are aspects of the game which are neither good nor bad, but features which will affect the gaming groups this game would be suitable for. I would characterise Snowdonia as a medium weight game. It is one I would recommend for regular gamers – it is probably has too many rules to qualify as a gateway game. This is clearly a game where the theme is intrinsic to the game. This is not an instance where the game can be charged with a pasted on theme, although that can only be taken so far – the railway under construction could be anywhere – it doesn’t have to be the Snowdonia mountain railway. In fact the game designer did mention that he was working on an expansion track for the construction of the Darjeeling railway. I have no hesitation in classifying this as a balanced (euro) style game and not a thematic (ameritrash) one. Snowdonia claims to play 1-5 players in about 75 minutes. I have no knowledge of the solo rules and so cannot comment on those, and also don’t have much feel for how the game would play for 2. I believe the game will play very well for 3-5 players, and will play within the stated time, in part thanks to the Action Track/Event cube mechanism. There are no direct attack mechanisms. Player interaction is strong, but indirect. Snowdonia is both a strategic game and tactical game. On BGG the Strategy Games category is used to mean games which favour well balanced game mechanics – what are commonly called Euro-style games. I use the term Strategy in the sense of there being approaches a player can decide upon at the start of the game and seek to carry through. In this game a player may decide to mostly excavate, build track or avoid getting a train by collecting lots of goal/action cards (and there may be more). Snowdonia therefore is genuinely a strategic game. The event cube and action track mean that Snowdonia will not outstay its welcome by dragging on too long. There are some variable elements (mainly the weather, I think) which could cause the game to take longer than intended if foggy and wet weather comes up too often. This has been circumvented by the action track. There are some good random effects built into the game, such as the resource cubes, event track, action/goal cards and weather, to ensure good replayability and a lot of interesting tactical choices. If successful, this game could see expansions before long. The Game designer mentioned the possibility of different tracks to build, and different actions for the players to select, which could be achieved by different action overlay cards. What’s bad about this game? This can only be a personal choice, but personally I found the artwork bland. I didn’t hate it, but I didn’t love it either, and it didn’t draw my eye to the table and make me want to play. There are lots of similar resource management worker placement games on the market. They have been done very well here – in my opinion sufficiently well to be worth playing/buying, but there is no denying it faces a lot of competition. Snowdonia Was jointly one of my two best gaming experiences of the UK Games Expo. It is a medium weight resource management and worker placement games which will play in just over an hour for up to five players. This is a category which I play quite a lot, and as a player with strong preferences towards balanced (euro) games, it is always good to find another good example. There is a lot of competition for this style of game, and any addition needs to have some eye-catching features to get noticed. In this case the artwork is a negative, although I should stress it isn’t awful by any stretch, and in fairness the fact that it is done in the same style as previously successful Lookout Games publications may even help. In terms of the mechanics, the stand out feature for me was the goal/action cards, which offer a lot of tactical possibilities and increased replayability. I also liked the way the action element on a card would not help towards achieving the goal on the card. Players will need to acquire multiple cards and look for synergies. Also, selecting a goal card whose conditions a player ends up not meeting is still not a completely wasted action. I liked Snowdonia a lot, and plan to purchase it for myself when it becomes available. I would recommend it for players who regard the features listed above as positives, and can find sufficient room in their collection for another good resource management worker placement game. Despite my mildly negative opinion on the artwork, I do not feel that this should deter anyone from buying. Overall a very weel designed game which I think will be a success. Thank you very much for this review, it is an interesting read. You stated that you found the artwork very blend. Unfortunately on the picture you included in the review I cannot see much of the game's artwork. But I could when I saw Tony Boydell's blog. Is it the same artwork you saw or did you play a prototype? It looks like Graham played with the (near-)final art, although there is always the possibility it may be tweaked yet. One important thing to remember is that Snowdonia is an excellent game coming out of a very small and low-budget operation in Surprised Stare games. Tony has spoken at length at how expensive it is to hire one of the well-known artist, to the point of not really being practical or affordable. Bearing that in mind, it's impressive that all of Surprised Stare's artwork is produced entirely by Tony B, Charlie Paull (both co-owners of Surprised Stare, and Tony has never claimed to be anything other than an amateur artist. I, for one, am very impressed with how much more sophisticated it is since the Coppertwaddle days), and Vicki Paull (Charlie's daughter, who does do some professional design - Braggart most notably). I can understand how it wouldn't be to everyone's tastes (I have had the same feelings about past games), but at the end of the day, if you want Michael Menzel, you have to PAY for Michael Menzel. Excellent review, though, and I agree with pretty much all the rest of it, including a share of the same concerns that worker-placement-resource-management has nearly been done to death. The version I played was near final - the UK Expo was late May 2012, so I don't think there will be much time for reworking it before the due release date at Essen. I would like to stress that I liked the game and the artwork was a minor downside for me. Given that the first two comments concern it, I perhaps should expand a little. I liked the train cards, and I thought the iconography was good and functional. I thought the game board looked a little washed out and bland, and collectively there wasn't much colour about. I really don't want this to come over as a negative review, or a major discussion about the artwork. I intended to write a positive review which would help the game (which I enjoyed playing a great deal) become a success. I hope I haven't got the balance wrong. I didn't take it that way, Graham. But I'd be a poor friend to Tony if I didn't attempt to rebut some of the criticisms. At least, the ones that I don't provide for myself. Since the days of SSGs Confucius, we value 'art playtesting' as highly as any other aspect. At the Expo I was taking note of player comments about clarity, spacing etc and these have been fed back to Klemens! I know that some folks won't like it as much as others, but I felt I needed to explain - even just a little bit - the thinking behind the palette. Snowdonia is a game I really look forward too. Reading about this game caused enthousiam with me. It made me watch videos about the Snowdon Railway and the Jungfraujochbahn. I wrote this preview about the game. I like the artwork, meaning that I like what I have seen thusfar on this forum. Only, maybe the building cards contain too little artwork meaning that it adds little to the atmosphere. Maybe two cards per building or bigger cards is an idea. And does each train have it's own artwork? Hi Tony - thanks for posting. During my game at the UK Expo you mentioned some great stuff you had learned about the history of the building of the Snowdon mountain railway (crashes and so on). Will there be any space for historical notes in the rulebook? I really like that sort of thing when a game has a historical rooting. I was just revisiting this idea yesterday - been running through the minutae of the rulebook and not sure yet if we'll have enough space within the Lookout Games template to slip in a few 'factoid bubbles'. Personally, I think I'll be trawling my library of Snowdon ephemera and putting something together as a PDF to download from our website/the Geek - hopefully in time for the Essen launch! I am very curious as to what other worker placement games you have found that are about the same weight and can be played in under an hour. I am not doubting you, but I have never seen any games of this type that play as fast, so I would love to know which games you feel compete directly with Snowdonia. Actually, that is a very good point. The action track mechanic speeds Snowdonia along and pretty much guarantees it won't run too long. There are lots of games which (for me) provide a similar amount of strategic decision making, but generally they would run slightly longer. Not massively so - maybe an extra 15-25 minutes tops, which is why I was putting Snowdonia into the same category. And now that you're asking for examples I cannot, of course, think of any of them. I feel that Snowdonia has unique selling points which (off the top of my head) include the action track which means the game will not run too long and will occasionally mess up your plans, and the goal/action cards with their double function. These are different enough from other worker placement resource management games for me to want to buy Snowdonia (speaking as a fan of the genre with similar games already in my collection). Having played Snowdonia several times I would say that a couple of games can offer similar depth and play time - on the assumption there is no rules explanation etc. I am very grateful to Tony for his enthusiasm, good grace and patience in letting us play test this game for a while here in Lexington KY. It is also a great game because as a Welshman I ALWAYS go first and am the only one who can pronounce all the stations correctly. Seriously It has been a great honour to help play test a game. I love the evolution of the artwork, all stages have had their charms. I really liked the noggin the nog series though (hint hint for another expansion). For me the two greatest parts of the game are the event cubes (where the game plays) and the weather. Though for some reason its far too sunny during the game based on my experience of Snowdon (I grew up in Wrexham, North Wales). These two elements can put a real kybosh on your strategy, but they can speed the game up in unexpected ways. Unlike many worker placement games, LeHavre, Agricola, Pillars etc etc, there are not a lot of different cards to keep track of so newbies can pick up the game pretty quick. It will be nice to play with a real game, with real pieces rather than home made fimo resources and meeples, though we did have fun making them. I only just noticed this game, thanks to Games Lore's newsletter. As I lice in Snowdonia, and have been meaning to get a train-related game, I'm pre-ordering this one. 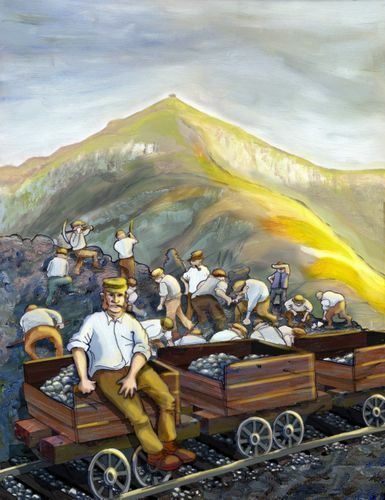 A few years ago, I did some management development work for the Snowdon Mountain Railway company, so it has a real hook for me. Looking forward to it. Just goes to show how subjective these things are; I loved the artwork, and getting Ivor the Engine was just an added bonus. Looking forward to playing this one again soon. I think this game looks great--wish I could find a copy. Any new news on reprinting? I think the game's architects were quite successful in capturing the unusual and majestic Snowdonia landscape, dappled in the hues of its dynamic weather patterns. Somehow they were able to render the mesmerising, ecru-tinged, crystalline light just perfectly -- whilst simultaneously conveying, via game components, a sense of the hazy mists, rains, and memorable blues, as reflected in the skies, lakes and shadowy peaks. At first glance I too felt the board and cards were a bit pale and industrial looking -- primarily noting the provincial railway construction elements. However, after viewing videos and images of actual Snowdonia, I came to have a new respect for the subtle and accurate visual aspects of this game. Of course, in my opinion, the weather-driven gameplay and mechanics sync perfectly with theme. Muliplayer or Soloplayer, there's more to this lovely game than one may conclude at first glance. I must confess that now I am absolutely intrigued by both the game and the place! Snowdonia National Park is well worth a visit if you're into the fresh air and hill walking. I went scrambling there once in my younger days, and it is a beautiful part of the world.